For spring 2012 designers are inspired by diverse influences, showcasing a range of styles and lifestyles — from free and playful to light and breezy, plus contemporary classics. For spring 2012 designers are inspired by diverse influences, showcasing a range of styles and lifestyles — from free and playful to light and breezy, plus contemporary classics. The colors likewise reflect these differing moods, encapsulating vivid brights, soft muted tones, and fun-loving pastels. “Consumers look to spring for renewed energy, optimism, and the promise of a brighter day,” says Leatrice Eiseman, executive director of the Pantone Color Institute. “They have learned how color can help them alter a mood, while providing the vitality and enthusiasm that enables them to experiment with new looks and color combinations.” The Pantone Fashion Color Report Spring 2012 predicts that tangerine tango (shown in illustration and named by Pantone as the “color of 2012”), bellflower, cabaret, and seven other hues will make up this season’s palette. View the full report at www.pantone.com/spring2012. Nails (left to right) by: Susan Wood, Serenity Salon & Nails, Deer Lodge, Mont. ; Mariko Mabrey, Nail Affair, Chesapeake, Va.; Taylar Hillman, Bliss Hair Body & Boutique, Anaconda, Mont. 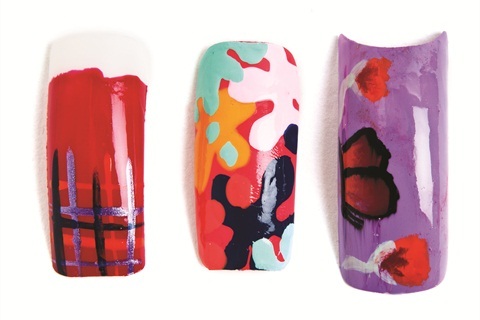 View a slideshow of all 10 spring shades at www.nailsmag.com/spring2012colortrends. Pantone colors displayed here may not match Pantone-identified solid color standards. Consult current Pantone for fashion and home color system publications for accurate color. Pantone and other Pantone LLC trademarks are the property of Pantone LLC.